Violinist Mark Bjork, Professor of Violin and Pedagogy at the University of Minnesota School of Music, is a graduate of Indiana University where he studied violin under the renowned pedagogue Josef Gingold. He has free-lanced throughout the Twin Cities for over 40 years, appearing not only with the Minneapolis Pops Orchestra but also with the MN Opera, VocalEssence, MN Dance Theater Nutcracker, touring groups and countless others He has also performed widely as a soloist and chamber musician, performing more than 40 works with the LaSalle Trio in an annual concert series as well as in radio, TV and tour performances. 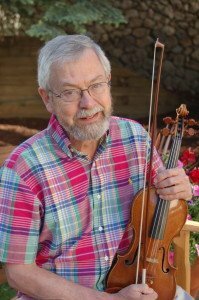 Mr. Bjork is recognized internationally as a leader in the field of Suzuki Talent Education: in 1967 he started one of the first Suzuki programs in the U.S. at the MacPhail Center for the Arts (part of the U of M at that time). Workshops, master classes and clinics, often related to Suzuki Talent Education, have taken him throughout the U.S., Canada, South America, Europe, Australia, New Zealand, Korea, and Japan. His former students include concertmasters, chamber music performers, and teachers. Bjork is the author of “Expanding Horizons: The Suzuki-Trained Violinist Grows Up”.